Where can I find out about Donations tax? How much can I donate without incurring donations tax? Casual gifts by companies and trusts: R10 000. Donations by individuals: R100 000 (2008 to 2013 years of assessment) (section 56(2) (a) and (b)). How will I know how much I have donated at any one time? You will receive a monthly statement by email. What happens when I have reached my R10,000 and R100,000 limits? Do I need to issue a tax donation certificate? If your beneficiary requests one, you will be required to provide one. What details must be put on the section 18A receipt? 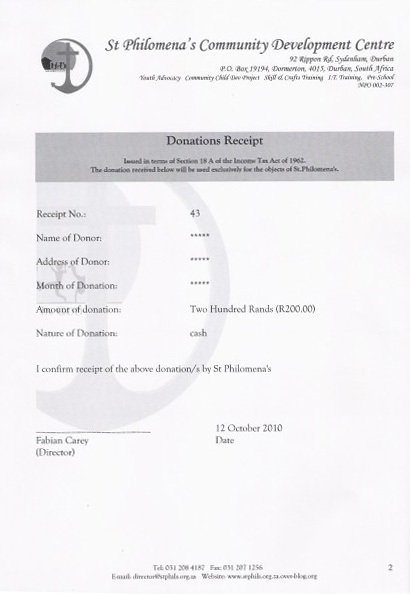 The receipt must be issued in the year when the donation is received by the organisation approved for purposes of section 18A. Can I donate to anyone outside of my country? No. Your beneficiary will have to provide banking details local to your country. No international payments will be allowed. Any organisation or company that is operating illegally in any manner whatsoever. Any organisation that has any links to theft, terror or drug or human trafficking. How many donation beneficiaries can I have? You can have up to FIVE beneficiaries. How long will it take to register a beneficiary? It will take 3 – 5 working days for South Africa. 3 – 10 working days for the USA. Is there a charge for making or receiving a donation ? No there is no charge. How do I go about changing one or more of my beneficiaries? You will need to send an email to admin@yummymummyz.co.za requesting the changes. How many times can I change my beneficiaries? Each beneficiary can be changed once. As a donor, if I wish to claim tax deductions, who can I donate to?